We are somewhere else. 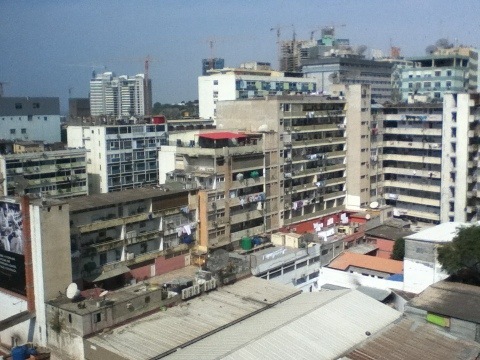 Arriving in Luanda, we notice the vast slumscape (musseques) surrounding the airport. Leaving the airport for our hotel, the traffic is highly congested, bordering on gridlock. Street vendors by the dozens wander among the sitting cars selling watches, hangers, CDs, food, shoes, sandals, dog muzzles, purses, wireless internet cards, cell phones, car seats, soccer balls, … and just about anything else imaginable. Brasilian or Brazilian-sounding music is on the radio and Portuguese, not English, is the dominant language. After being in three former English colonies, it seems strange that people are driving on the right side of the road. The driver of our van tells us to lock the doors while inside (I assume because of the high crime rate). It is immediately apparent that the vegetation is more tropical than where we have been (more palm trees). Yes, we have set foot in a different world. Welcome to Angola! We are met at the airport by Public Affairs Officer Adelle Gillen, who accompanies us most of the rest of the day as we check into the hotel, meet Ambassador Christopher McMullen, get a safety/security briefing and go to dinner. Her ability to speak Portuguese is essential for us to get around as none of us are familiar with that language. We are brought up to speed on the schedule for our stay and our many questions about the country are answered by Adelle, Assistant Public Affairs Officer Daniel Villanueva and Andre. Hopefully we are ready as we have a busy day tomorrow. Enjoy your last bit of warm weather. It is 23 º this morning in Chicago.